MedReady 1700FL Free Shipping | MedReady Inc.
SKU: 1700FL. Categories: Medication Dispensers, Non-Monitored Medication Dispensers. Tags: Dispensers, Pill Dispenser. This 1700-FL (Flashing Light) MedReady comes standard with the Lower Frequency alarm which from our experience is much easier to hear. You can also independently enable and disable the audible and visual alarms. For those who have difficulty hearing a buzzer or alarm, we developed the Medready 1700FL, a unit with a red Flashing red Light to alert the patient that it is time to take their medication. MedReady 1700-FL Flashing Light Package comes complete with A/C Adapter, Rechargeable Battery, Medication Tray, Blue Locking Lid, 2 keys, and loading rings for 3x and 4x per day dosing. This dispenser holds up to 28 doses of medication and can dispense from 1 to 4 times per day. Each dispensing compartment can hold up to 9 M&M size pills. This is a non-monitored dispenser. Purchased for 89 year old mother who was constantly mismanaging her meds. my only suggestion for modification would be alarm level adjustment. It’s quite loud. Thank you very much for great product. Thank you for the review, this is what keeps us going. The alarm is a mechanical buzzer so it’s all or nothing at the moment. Future mods have a speaker in mind that would be able to modify the decibel level and select different alerts. No time frame yet for that release. 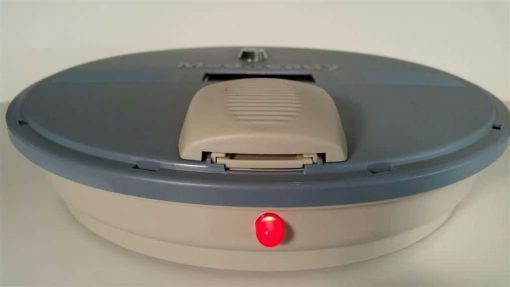 Using the MedReady 1700FL makes everyone’s life a lot easier from the daily medication dilemma of an Alzheimer’s patient of wondering “is it time yet to take my pills” and also “did I take my pills”? 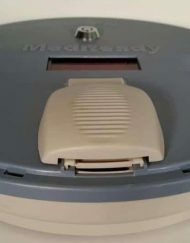 Myself as the caregiver, I now simply load the MedReady just ONCE a week with the correct pills in the corresponding tray slots, then both the patient and myself know when the dispenser’s alarm sounds it is the correct time to take the correct medication. Simple for the caregiver to set-up right out of the box and very simple for the patient to use (they just slide open the door when the buzzer sounds and scoop out their pills). Loading the pills into the correct slots with the included pill dispensing guide makes it easy for the caregiver. I plan to order an 2nd dispensing tray with plastic lid, so that I can preload the pills for the next week in advance and during my own leisure, thus I will have the 2nd tray ready-to-go; just simply remove the empty tray and drop in next week’s ready-to-go tray. No more watching the clock and wondering by my Alzheimer’s patient. They admit life now is so much easier for them when using the dispenser, and I must admit life is so much easier for me as a caregiver too. Recommend it to any caregiver. 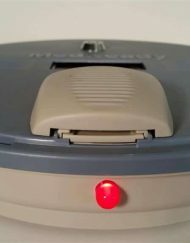 I have been using the MedReady unit for several years now and could not be happier. I tried several “manual” dispensers that turned out to be a waste of time and money. My Mom, who is now 90 years old, would fuss with the old units to the extent that I was worried that she was either not taking her meds at all or even worse overdosing. This unit calls my cell phone if she fails to take her pills. That still blows her mind when I call her and tell her that the machine called me to tell me that she didn’t take her pills yet. Editors note: This is actually a review for the 1750FL. This pill dispenser has been a wonderful help with my wife’s mother who is living alone and cannot remember to take her pills. We are saving a fortune compared to the price of assisted living or frequent car trips to check pills. Even more important a huge source of worry and stress is gone. Highly recommended! When I started my search for an automatic pill dispenser for my Grandmother that has Alzhemier’s, I came across some shocking information. One missed dose of medications cuts the effectiveness of the medications by 45%. That is very unsettling. At that point, I was on a mission to find a product that could help us with this problem. Then I came across the MedReady 1700, it was the answer to our prayers. We bought this for my Grandmother 3 years ago. The only time she misses a dose now is when she isn’t in her apartment when the alarm finishes going off after the 30 minutes. And never do we have to worry that she is taking more than her 2 doses a day. And that was starting to be a problem. I have recommended this to many of my friends with parents/grandpa-rents with similar problems. Thanks a million. This product gave me piece of mind knowing my mother is getting her meds properly. No more taking double doses. I highly recommend this product. I bought it for my mother-in-law who has Alzheimer’s. We still have to call her and remind her to go open the dispenser but now she can’t take more than she is suppose to. I truly like the convenience of only filling every 14 days (she takes meds 2x/day). It is wonderful.